Waste Reduction Partners is offering no-cost water efficiency assessments of industrial, commercial and institutional water consumers in the Triangle region. Promoting demand-side management strategies among ICI customers is an important approach toward long-term water resources management. The ICI sector consumes approximately 37 percent of public water supply in North Carolina. By 2060, the Triangle region is expected to grow by 1.6 million people and will need an additional 95 million gallons per day of drinking water beyond current supplies. Who is eligible for a no-cost water efficiency assessment? Any qualifying large water-consuming organization with a commitment to water efficiency sustainability. Organizations must be industrial manufacturers, large businesses or institutions with sites located in the Neuse or Upper Cape Fear River Basin (Haw River sub-basin) within the counties of Durham, Orange, Wake, Chatham, or Johnston. Who conducts the on-site water assessment? Waste Reduction Partners uses a team of retired engineers and scientists with extensive experience to make site visits and follow up recommendations that the firm may consider for implementation. Waste Reduction Partners is a regional government program dedicated to promoting pollution prevention practices, including conserving the state’s water resources through cost-effective approaches. Learn more about volunteer opportunities at WRP. How will this assessment benefit my firm? After the on-site assessment, a non-regulartory report is provided which includes water efficiency recommendations, expected cost savings, estimated cost of implementation and investment payback. WRP typically identifies 5-25 percent water-use reduction opportunities which can achieve operational cost saving in water, sewer, pre-treatment and energy savings. How is this work coordinated with my water utility? WRP is working with the Triangle region’s major utilities to support and enhance their existing demand-side management programs in the business and institutional sectors. Water utilities in Durham, Orange County and Cary are actively marketing these assessments to selected large customers. 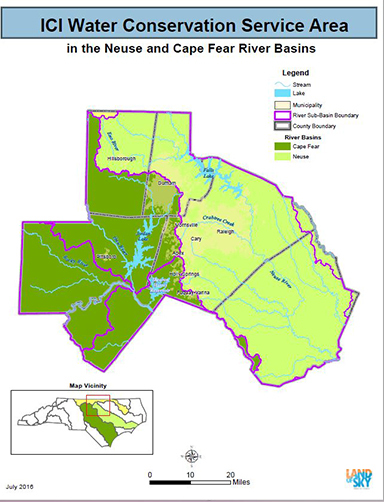 Waste Reduction Partners, a program of the Land of Sky Regional Council, is receiving support from the Duke Energy Water Resources Fund; City of Durham, Department of Water Management; and the NC Department of Environmental Quality. Find out more and request an assessment.